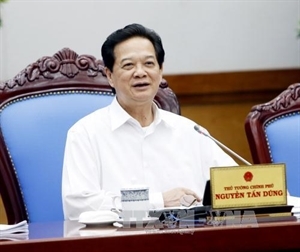 The 2015 socio-economic goals are feasible based on the past seven-month performance and provided efforts continue to be made, Prime Minister Nguyen Tan Dung made the remarks at the monthly Government’s meeting in Hanoi on July 31. Reports at the meeting said positive developments have been seen in most fields, with a more stable macro-economy, controlled inflation and growth buoyed by manufacturing and processing, coupled with improved total demand and purchasing power in both the domestic and export markets. In his speech, the PM demanded continuing synchronous and effective measures set from the onset of this year. Each sector must choose their own core and breakthrough stages to achieve as many goals as possible, especially those related to growth, he said. He agreed to the tasks set forth by the Ministry of Planning and Investment in its January-July socio-economic report, including pushing forward with improving business climate and national competitiveness, flexibly adjusting interest and foreign exchanges rates, closely monitoring prices and market movements, effectuating fiscal policies, boosting exports and controlling trade deficit, and ensuring social welfares for citizens. On the National Target Programmes, the leader asked relevant agencies to acquire feedback on a report reviewing the programmes, especially those on new rural area construction and sustainable poverty reduction. He and government members also voiced their firm determination to push e-government model forward and agreed to issue a resolution and specific plans and directives on this respect. 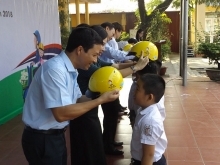 Agencies concerned were told to provide the United Nations bodies with correct data regarding indicators assessing Vietnam’s e-government model. Minister of Agriculture and Rural Development Cao Duc Phat told the meeting that his ministry is taking drastic actions to restructure agriculture sector, which is facing difficulties due to natural disasters and dropping farm produce prices. Participants proposed giving priorities to production and trading, trade promotion at home and abroad, adoption of technological advances in manufacturing, strengthening connectivity in production, processing and consumption, and capitalising on opportunities brought about by free trade agreements. The meeting also discussed a report on piloting price stabilisation for container handling services at Cai Mep-Thi Vai deep-water seaport in Ba Ria-Vung Tau, and draft revised laws on child protection, care and education, and pharmaceuticals. Also high on the agenda were support to the poor and the underprivileged in remote and disaster-prone areas, improvement of health care services, control of epidemic diseases, and food hygiene./.